This winding route follows the dramatic stretch of coastline along a glacial fjord that links Puget Sound to the Pacific Ocean. Featuring rugged cliffs, forests and the potential to see eagles, otters and gray whales, the route is beautiful at any time of year. Don’t forget a stop in the quaint fishing villages of Clallam Bay and Sekiu. 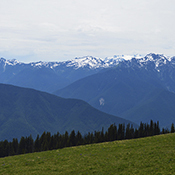 From our Port Angeles terminal, head southwest on Highway 101. Continue on Highway 101 until you reach a turnoff for Highway 112. Turn right on Highway 112, heading west all the way to Neah Bay. 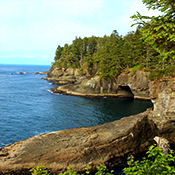 The route on Highway 102 from Port Angeles to Neah Bay can be done in a day, however it is recommended to enjoy the ride and spend a night at one of the suggested accommodation options. 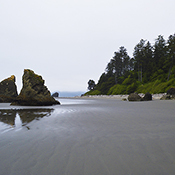 From Neah Bay heading back to Port Angeles, travel back on Highway 112 until you reach the turn off for Highway 113. Take a right turn on Highway 113 and continue until you reach the charming town of Sappho. From Sappho, head east on Highway 101 towards Lake Crescent. Lake Crescent is a great rest stop to explore one of the many waterfalls in the area or enjoy lunch at the lodge. 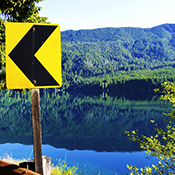 Enjoy Highway 101 through Lake Crescent all the way back to Port Angeles, Washington. Head back on board the M.V. Coho or continue southwards to explore the Pacific North West with one of our other suggested scenic trips below. The Dungeness Spit is the world’s longest naturally occurring sandspit, stretching over 5.5 miles (8.8km) along the northernmost coast of the Olympic Peninsula. The spit is a wildlife sanctuary, and is home to the Dungeness National Wildlife Refuge, designed to preserve a breeding ground for native birds. One of only a few such geological formations in the world, the spit was formed during the Vashon Glacial era tens of thousands of years ago. At the end of the spit is the old lighthouse, built in 1857, accessible only to hikers in low tide (check the tides) and small watercraft in calm seas. Allocate at least 4-6 hours for the hike, where you will likely see bald eagles, plus a variety of bird and plant life.